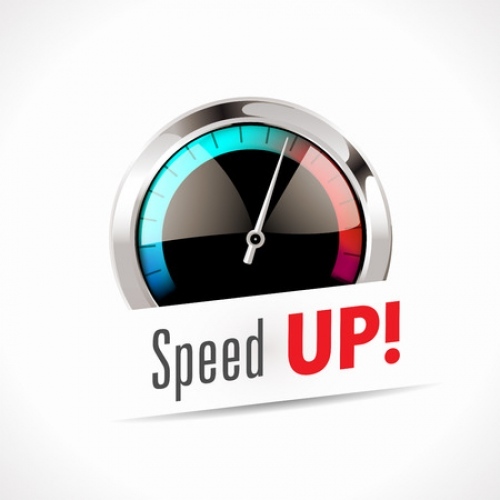 Ofcom’s annual study of fixed line home broadband ISP speeds across the United Kingdom has revealed that the average Internet download rate is now 36.2Mbps (up from 28.9Mbps last year), with uploads hitting 4.3Mbps (up from 3.7Mbps). But there’s a widening gap between rural and urban areas. The data for this study was gathered during November 2016 via specially modified routers from SamKnows, which were installed in around 2,023 homes across the country. Of course the limited sample size remains a hindrance and as a result the regulator’s study is only useful for reflecting the performance of those who subscribe to the largest ISPs (i.e. BT, Sky Broadband, EE, PlusNet, TalkTalk and Virgin Media). On top of that we should point out that Ofcom rebalanced the study last year so that their sample data was “less dominated by high-speed packages“, which means that the regulator’s pre-2015 results from similar studies may not make for a perfect comparison over time. Firstly, it’s important to put today’s latest results into some context. At present fixed line “superfast broadband” (24Mbps or faster) networks, most of which use some form of Cable (DOCSIS) or FTTC (VDSL2) technology, are available to around 92% of the United Kingdom, although a little over half of the country still subscribe to the much slower and less reliable ADSL (up to 8-20Mbps) based pure copper line services. You can see the difference in real-world speeds by connection technology and time of day below. This is useful data because the Advertising Standards Authority (ASA) is widely expected to require that ISPs start promoting average speeds instead of ‘up to’ rates (top 10% of fastest connections), although they’ve yet to confirm this. Using this approach an ‘up to’ 76Mbps FTTC package might instead promote an average of c.60Mbps. In other words, it’s crucial not to equate speedtest based studies like this to reflect the availability of faster connections as the two are far from being in perfect sync. Similarly not everybody out there can afford, is aware of or even feels the need to upgrade to a modern “superfast” connection, even though such a service might well be available to them. On the other hand there are some areas where the availability of superfast connectivity is still a significant problem, such as in many rural areas (mostly reflects the last 10% of UK premises). In those locations the existence of slower connections is much more pronounced in the data. Ofcom’s analysis shows that the average download speed in rural areas of the UK was 12.2Mbps in November 2016, compared to 40Mbps in urban areas. Take note that the table below confusingly appears to use different weights and so the results won’t be quite in line if you try to make a UK average from the nations combined. At this point we should add that the Government’s Broadband Delivery UK programme is working to expand the reach of “superfast” capable broadband services to 95% of the country by 2017/18 and there’s an expectation that this could reach 97% by 2020. On top of that the planned 10Mbps Universal Service Obligation (USO) may also improve the performance for those in the final 2-3%. Most of the work to close the current “superfast” availability gap (between 92% coverage today and 97% in 2020) is taking place as we speak, although it’s worth pointing out that many urban areas are also starting to benefit from a new generation of “ultrafast broadband” (Ofcom defines this as 300Mbps+, while others prefer 100Mbps+). For example, Virgin Media’s EuroDOCSIS 3 based hybrid-fibre coax network has already made 300Mbps capable and FTTP connections available to around half of the UK and they look set to cover around 65% by 2019. Similarly Openreach (BT) are deploying ‘up to’ 330Mbps G.fast technology to 10 million UK premises by 2020 and this should reach “most of the UK” by 2025 (including their FTTP commitments). Both of those deployments are largely targeted at urban areas (i.e. the low hanging fruit), thus the urban vs rural gap may continue to grow. Elsewhere it’s no surprise to find that the performance split by connection technology hasn’t changed much since the last report, with Virgin Media’s still superior cable network continuing to do well and older style ADSL2+ services looking increasingly rubbish. At this point we note the results from a related Ofcom survey, which found that Virgin Media delivered the highest level of consumer satisfaction with broadband speeds (91%) and that compares with 83% for Sky Broadband, 80% for BT and just 71% for TalkTalk. However this is hardly a surprise given that Virgin’s HFC DOCSIS cable network is superior to the ADSL and FTTC dominated Openreach platform used by the others. 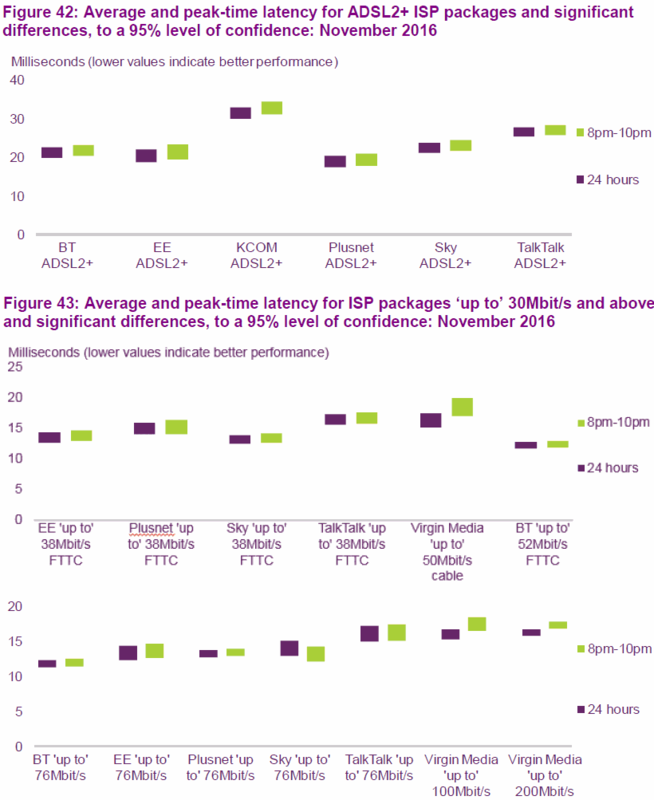 The following table highlights the context for this result by contrasting the advertised (headline) service speeds of each connection / package type by the average of what subscribers actually received. It’s worth pointing out that both FTTC and ADSL based connections are very susceptible to signal degradation over distance and poor quality home wiring, which makes it harder for many people to get the best speeds. Mind you the above table only reflects the mass market technologies, which are largely dominated by ADSL2+, Openreach’s 40-80Mbps Fibre-to-the-Cabinet (FTTC) and Virgin Media’s 300Mbps capable Cable network. Sadly the small sample size means that we don’t get to see any results from superior FTTP/H based connections. However it’s clear that there are some big variations, particularly on FTTC services and at the top ‘up to’ 76Mbps package level where the real-world averages struggle to get near to the advertised speeds. Mind you even Virgin Media’s 200Mbps service struggles a bit but we doubt too many people will moan when the average is still around 169-177Mbps! It’s good to see that this report has reintroduced Latency into the study, which is a crucial measure of the time (delay in milliseconds [1000ms = 1 second]) that it takes for a single packet of data to travel from your computer to a remote server and then back again (ping). A lower score (shortest time) is always best for latency and this measure is especially important for fans of online multiplayer games, where a low ping gives you smoother and more accurate gameplay. Generally speaking there’s not a lot of difference between the ISPs and everybody should be fairly happy with the latency performance, even ADSL lines manage to deliver 30ms or less and that’s fine for fast paced gaming. However there’s clearly some benefit from adopting one of the more modern “superfast” services, which shave 5-15ms off the latency times. Just remember that latency is also affected by other aspects too, such as Internet content services / servers and your own network setup etc. Finally, we note that Ofcom also examined the related measure of Packet Loss (i.e. how much data goes missing during transmission, which the connection must then automatically correct). During normal operation most of the ISPs tested delivered packet loss of around 0% to 0.2%, which is fine. However during peak times (8-10pm) packet loss could spike to nearly 0.8% but this isn’t really high enough to cause much of a concern and most people will never notice its impact. Readers should take note of Ofcom’s Voluntary Broadband Speeds Code of Practice (note: a separate version exists for small business users), which broadly requires member ISPs to provide reliable estimates of connection performance during the order process and to also help resolve related problems when they arise. On top of that the code requires ISPs to give new customers a Minimum Guaranteed Access Line Speed (MGALS) upon request, which reflects the access line speeds achieved by the slowest 10% of the provider’s broadband subscribers. 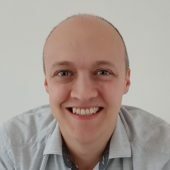 Crucially, if the ISP cannot resolve your problem and the performance has fallen below the MGALS level then the code allows you to leave your contract penalty free and switch to another provider, although this won’t necessarily resolve the underlying problem (especially if it’s related to Openreach’s infrastructure and you swap to another Openreach based ISP). However Ofcom does say that they are “seeking to update the code” so that speed estimates reflect the impact of contention, and to ensure that customers have better information about their right to exit. The regulator plans to consult on an updated code in summer 2017. Sadly this does not include those still stuck on ADSL where they are the ones still with sub 1meg speeds. Many exchange only lines are being left behind in the speed stakes as BT still not showing they intend to resolve the issues. Some of these may be close enough to get 5 plus Mbps but majority are below. Yikes, I’ll be below average soon. Ofcom are still using mean average when combining adsl,fttc,ftth etc. A statistical nonsense which overstates the average user speed. According to TBB’s latest speed test results, the median/mean are closely correlated. @AndyH I have not seen any Thinkbroadband stats later than this: http://www.thinkbroadband.com/news/6711-broadband-speed-and-the-difference-in-averages.html which shows the median speed was about half the mean speed. One milestone was quietly reached near the end of last year: the number of subscribers to BT’s NGA infrastructure plus the number of VM subscribers went over 50% of the total number of fixed-line subscriptions. The median fixed-line subscriber is now on a fibre-based connection. Talking about “the average user” no longer reflects ADSL infrastructure. We know around 10% of BT’s connections (about 0.7m) are less than superfast speeds, so the median speed will still have been below 25Mbps. However, there has likely been 1 million subscribers added to those totals in the subsequent 6 months. That most likely means that the median speed is now about the 25Mbps threshold. “About” in the last line should be “above”. The second one, which I had looked for but not found, shows as I suspected a mean average of 25.6 but a median of only 17.6. The gap is closing as you would expect with more uptake of FTTC but is still substantial. @ gerarda – This is fixed line home broadband so you have to exclude wireless, satellite and 3G/4G! @AndyH Eliminating those will make very little difference. The basic point remains is that using mean average for a combination of ADSL, FTTC and FTTH is wrong because of the impact of a few very fast connections. You have to compare apples with apples, not a mix of grapes, apples and pumpkins. This is why average wage stats use median, avoiding the distortions caused by a few very highly paid bankers and company bosses. So what you want is the graph Ofcom give in the “dashboard” section on page 1? 14 different averages, for 7 technology/package variants, comparing golden delicious with golden delicious. No – just use median instead of mean average. In the meantime, the average speed of the FTTC_38 category is going to become relatively synonymous with the median speed for the whole set. – The FTTC_38 set is the slowest of all the superfast sets, so is the one that will (now) hold the median user (given my earlier post). Right now, the Ofcom average is 36Mbps, while the average of the FTTC_38 set is 34Mbps. Neither of those are significantly different between the mean and median. Should we really use the median for FTTH? With FTTH, what you see is what you get – you sync at the speed you buy. It’s not rate adaptive and does not depend on the quality of your line. Most people on FTTH packages buy the lower end speed variants, which is shown in the TBB results. But the fact is, those with FTTH can purchase significantly faster packages without any limitation. AndyH Are you being deliberately obtuse? I agree with Andy here. You cannot say that the mean for ADSL and FTTC are impacted by a few fast connections, because this is totally incorrect as corroborated by the statistics. It’s a mistake to assume the median is a better statistical measurement for broadband speeds. If everyone bought the product the fastest product available to them, then it would be more appropriate measure but people do not do this. 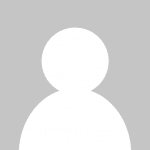 @manpreet – please read my first post in this section. In the last few posts, @gerarda is right. If you split the statements into separate technologies, then the “mean” becomes a meaningful quality for each. And it is useful to know this data. If you want to make a statement about “UK broadband” as a whole, incorporating all the technologies, then using the “mean” is a bad choice. Use of the “median” is a better option. A single figure for “UK broadband” is useful for press releases, politicians, and monitoring for changes year-on-year. But not much use for anything else. 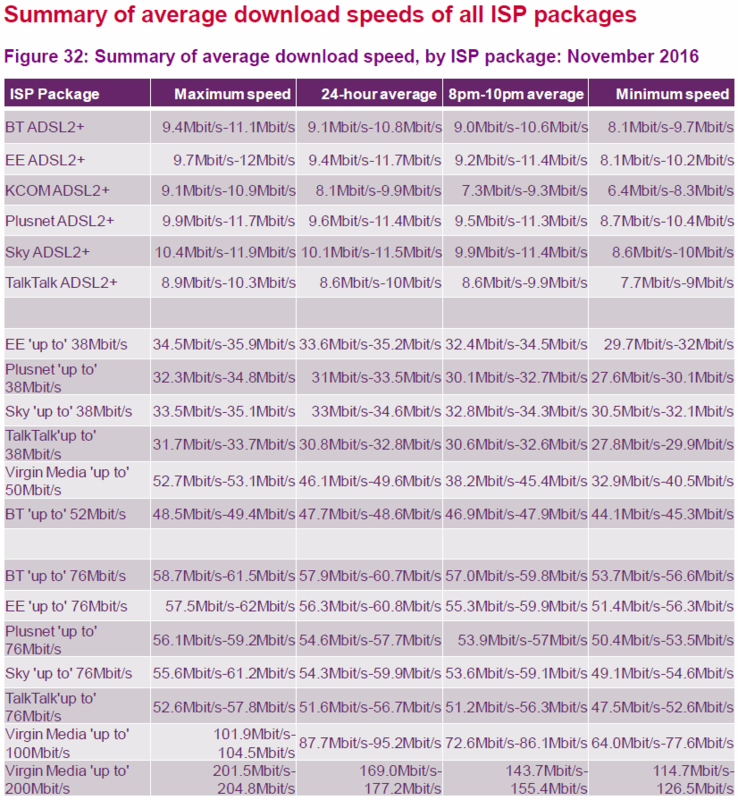 This particular Ofcom report is based on the speeds people actually get for the package they buy. The median is a good statistical measure for this purpose. The other report – the Connected Nation report (the old Infrastructure report) – is the one that monitors the fastest available broadband. That’s the one that cares whether we are at 90%, 92%, 95% or 97% availability of superfast speeds etc. The two reports cover very different aspects of broadband. Averages go up but our 2 Mbps EO lines in London remain consistently bad. I believe that our cabinet is set as FTTC_38. Our modem syncs at 21.61Mbps and we receive an actual (quite literally just over) 20Mbps. Clearly that is somewhat below the avearge speed promoted by OFCOM. We live just three miles outside the edge of the Greater Manchester conurbation so we are hardly “out in the sticks” or halfway up a mountain. Just where do OFCOM take their ridiculous non-real world speed measurements from? Make sure you are not using wireless or powerline networking when testing your bandwidth; they may be limiting your results. I just switched to Plus Net. Was getting 23Mb/s with the powerline network adapters. About the same on my cheap laptop and 38 Mb/s on my samsaung phone. So I used a long cable to my PC from my router and my bandwidth is now 38Mb/s. The powerline adapters were supposed to be rated much higher but I have a dirty electricity line and maximum transfer rate was just 23Mb/s. Best to use a wired connection whenever possible. I just ordered a dual band Intel Wireless card capable of 300Mb/s as a backup. TLDR: Don’t test fibre on old wireless standards such as G or early N because they actually transfer at a much lower rate than you’d expect. When talking about bandwidth of 40Mb or above you need to make sure you are using 100Mb or gigabit Ethernet or a decent dual band wireless card and router that supports it. Be careful of older powerline ethernet adapters as well. I’m in Australia and I just went over to high speed broadband with a technology called HFC which is a pay TV cable that has a Fibre to the node to connect the cable for the internet and I’m getting 93 download and about 40 upload and the telephone uses VoIP. The telephone number has to be ported like a mobile phone number that is going from one mobile network to another network and they have to do the work in the telephone exchange. The company that does it is called the NBN.